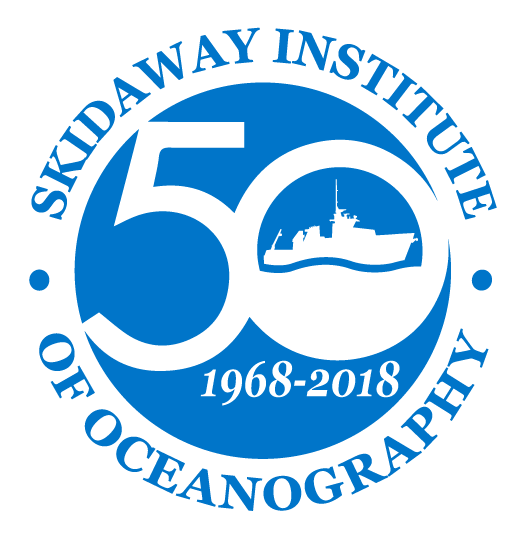 What is now the UGA Skidaway Institute of Oceanography was established in 1968 when Robert C. Roebling donated his Black Angus cattle farm on the north end of Skidaway Island to the State of Georgia for the establishment of a marine research facility on the coast. Mr. Roebling was a great-grandson of John A. Roebling, an engineer, who emigrated from Germany in 1832 and established the little town of Saxonburg in western Pennsylvania. His original intention of becoming a farmer soon gave way to his first love, bridge building. It culminated with his design and construction of a number of aqueducts and bridges, including the Niagara Suspension Bridge (the first to carry steam trains), the Cincinnati-Covington Bridge, and his crowning masterpiece, the Brooklyn Bridge. 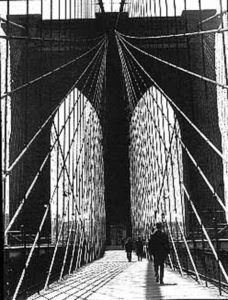 There is an old superstition that every bridge takes a life, and unfortunately, the Brooklyn Bridge took John A. Roebling’s life at the outset. The work remained to be completed by his son, Col. Washington Roebling. It almost claimed his life as well. Working in the pressurized caissons foundations for the bridge towers, he developed the bends. He eventually recovered but it was a long painful process. From his apartment in Brooklyn, he monitored the work on the bridge, relaying his instructions to the bridge crew through his beloved wife, Emily. She handled this with flair, diplomacy, and understanding. It would later be said of her that when the bridge was finished, she had the equivalent of a degree in engineering. John’s spectacular success in bridge building stemmed in measure from the wire cable business he founded, the John A. Roebling’s Sons Co. which formed the basis for the family fortune. Beginning with a hand-operated rope walk in Saxonburg, which was quickly outgrown, operations were moved to Trenton, NJ, where the family settled. Robert Roebling’s father Karl, president of the company, died in 1921, when Robert was still in high school, but it was during these formative years that Robert developed a love of the sea. 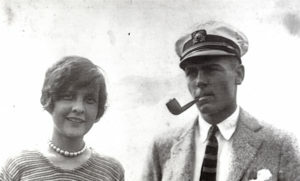 Four years after they were married, in 1925, Bob and Dorothy, or “Dickie,” as they were known, built their home, “Landfall,” on an 18-acre estate on the Trenton – Princeton Road. The following year their 170’ three-masted schooner, the Black Douglas, was launched at the Bath Iron Works in Maine. They sailed her around South America but the country they returned to was a far different one from the one they had left 10 months before. 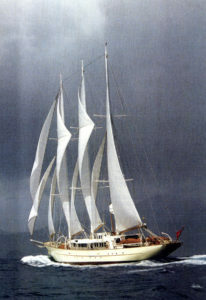 The Black Douglas, renamed Aquarius, in 1999. The Depression was in, Prohibition was out, and the gangsters who had run the speakeasies turned to kidnapping as a new source of easy money. Because of its notoriety, one tends to think of the Lindbergh kidnapping, which occurred a few miles from “Landfall,” as unique, but actually such acts were widespread. Shortly after the Lindbergh tragedy, the Roebling’s governess came into the children’s second floor nursery one night to find an intruder coming through the window. She got there just in time, but after this scare Bob and Dickie gave serious thought to moving. The Roebling Co. could manage without him. Business had tapered off, as it had everywhere, but contracts for the George Washington and Golden Gate Bridges sustained them. Some members of the family had already moved: Bob’s cousin, Donald Roebling, inventor of the famous World War II Alligator Amphibious tank, had moved to Clearwater, Florida, in 1929. As conditions in the industrial North worsened, the South seemed to offer some respite from the chaotic situation developing there. 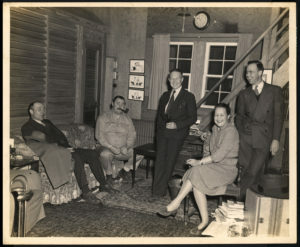 A neighbor of the Roeblings, Ralph Isham, owned a hunting preserve, Modena Plantation, on the northern end of Skidaway Island and he invited Bob down for a hunting trip. Bob fell in love with it immediately and bought it. The water was deep enough for the Black Douglas. They put the house in Princeton up for sale, and by the spring of 1936 the family was living aboard the ship tied to what is now SkIO’s north pier. 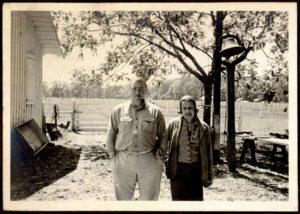 Robert and Dickie Roebling at Modena Plantation. Date unknown, but probably late 1930s. Over the years, Modena Plantation was restored to a working farm with barns, buildings, and farm dwellings, all powered by the generators on the ship. As war clouds gathered, however, plans were made to move the family ashore. The white stucco powerhouse / pump building, next to the SkIO shop facilities, was built in 1940 to take over the generating task of the ship. The island ran on 110-volt DC current augmented by large banks of batteries for periods when the plant was shut down. The house next to the swimming pool was constructed with high ceilings to be used for a gym but eventually became the Roebling home when the Black Douglas was sold in September of 1941 to the U. S. Fish and Wildlife Service. The boat was to serve as a fur-seal research vessel in Alaska but she got only as far as San Diego when the Japanese attacked Pearl Harbor. The Savannah Morning News reported she was fired upon by a Japanese sub, but she made it safely to Seattle, and the Navy was waiting for her when she arrived. Her beautiful Douglas fir masts were trimmed off and, armed as a patrol vessel, she spent the War years doing picket duty off Cape Flattery at Neah Bay, WA. Following the War she fulfilled her fur-seal mission, then was assigned to Scripps Institute of Oceanography and Southwest Fisheries in San Diego until 1966 when she was sold to a treasure hunter in the Caribbean. Later, the Flint School acquired her, restored her as a schooner, and used her as a floating school ship, plying Atlantic and European waters until 1982. At this time, she was purchased by foreign interests and rebuilt at Abeking and Rasmussen as the Aquarius. In 1948 Bob Roebling built a house on the east side of Skidaway for his mother, Mrs. Arthur O’Brien (she had married Arthur O’Brien, a corporation lawyer, after Bob’s father died). Having lived in Washington, D.C., and Seattle most of her life, she found the island setting lonely and after a few years decided to move to St. Simon’s. The Roeblings occupied her house thereafter. The University System of Georgia was a key player in the development of the farm from its inception. Robert Roebling with his prize bull, Blackcapmere. 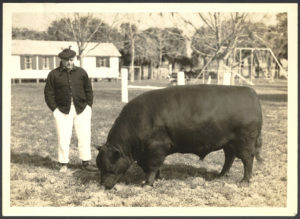 Starting with Hampshire hogs and Aberdeen Angus cattle, The University of Georgia provided guidance and encouragement throughout the farm’s existence. In large measure the farm was self-sufficient in the production of foodstuffs. The improvement of breeding stock was always a primary goal. At the time Roebling was finishing his mother’s house he also completed a large seven-sided steel and concrete production and show barn to house his cattle operation. Today it has been enclosed and is used for laboratory and storage space by SkIO researchers. In 1950 the Roebling’s elder daughter, Ellin, married Donnell Watkins, a resident of Kentucky. Their wedding reception was held in the barn. Ellin, flanked by Donnell Watkins and her father. Dinner tables were put in the stalls, with iced champagne in the feed troughs and flowers in the water buckets. An orchestra played, a buffet was located on the ground floor, and the wedding party occupied a table on the second level. 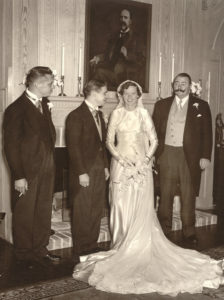 The wedding was reported in the Stars and Stripes (Watkins served under Gen. Patton during WW II) and Town and Country magazine. If you visit the barn, note the compass rose mosaic in the center of the building, directly under the skylight. Roebling attended Harvard and was an engineer. He figured the exact latitude and longitude of the spot, the elevation above mean sea level, and included a metal “needle” pointing to true North in the design. In addition to the cable business, the Roeblings were also partners in the Mercer Automobile Company at the turn of the century. Washington Roebling II raced their cars in “The Great Savannah Auto Races of 1908-1910-1911” and Bob was a life-long supporter of the Sports Car Club of America. Through the Savannah Foundation, he established “Roebling Road” in Effingham County for races and driver training. Dickie passed away in 1976 and Bob followed her in 1983, missing the return of their beloved Black Douglas, which came back to her original dock at Skidaway in 1996, to take part in the opening ceremonies of the Yachting Events portion of the 1996 Olympics. On June 6th, decked out in signal flags, she celebrated the 66th birthday of her Maine launching at Skidaway with a crowd of well-wishers, Navy Veterans, U.S. Fish and Wildlife personnel, and Flint School alumni who had served aboard her. She was the one who started it all and she is the reason for Skidaway Institute of Oceanography being located on Skidaway Island today. Robert and Dorothy Roebling’s children were Ellin, Karl, Wainwright, Clara, and Henry. A memorial service for Ellin, who passed away in July of 1999, was held on the Skidaway campus, not far from the dock where the Black Douglas was moored during her childhood. Doliolids are tiny marine animals so transparent they are practically invisible. Yet, these rarely seen and little understood organisms are a major driver of the marine ecosystem on continental shelves around the world. University of Georgia researcher Marc Frischer recently completed a major field study in the South Atlantic Bight on the continental shelf off the coast of Georgia in an effort to understand these mysterious animals. The study, funded by the U.S. National Science Foundation, involved 25 research cruises over a two-and-a-half-year period. Copyright © 2019 Skidaway Institute of Oceanography. All rights reserved.